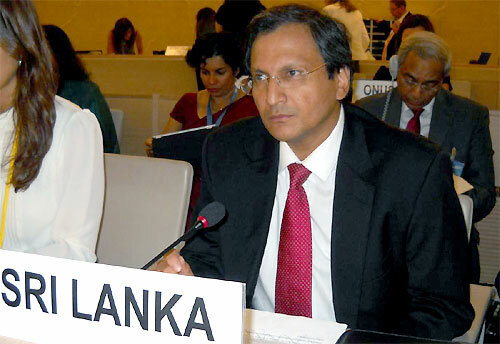 Ambassador Aryasinha said "the GoSL successfully embarked on a very difficult challenge of demining an area of approximately 5,000 square kilometers of land initially estimated to be contaminated with mines, out of which approximately 2,064 square kilometers were confirmed as hazardous areas. The scale of the problem Sri Lanka faced in demining can be clearly seen from the number of mines and other devices unearthed and neutralized during the demining process. Over 1,128,336 explosive devices (1,712- anti tank, 615,669-anti personal and 510,955 UXOs) have been recovered as at September 2014. Five years since the ending of the terrorist conflict in Sri Lanka, so far this year alone, a total of 55,761 explosive devices, including 78 Anti- Tank mines, 28,577 Anti Personnel mines and 27,106 UXOs have been recovered. Demining continues to take place as the number of mines and IEDs laid by the LTTE was extensive and their locations unknown."